The Parks and Beautification Department provides complete services for all passive parks, cemeteries and downtown corridors including landscaping, tree canopies, irrigation, fountains, litter control, community partnership programs and special events. These functions are divided into three divisions: Park Services, Forestry Services and Special Events/Community Services. Complete forestry services for all of Macon-Bibb County including tree and canopy maintenance, tree removal and reforestation of more than 250 trees annually. Maintenance of all flowers and shrubs in the downtown area, parks and facilities. Design, installation and management of all beautification projects in public spaces. Permitting and coordination of all Special Events -Road Races, Concerts, Performances, Festivals, Parades, Marches/Protest’s/Rally’s and Road Closures. Filming liaison for all movie, music video and television productions in public spaces. Promoting and coordinating public/private partnerships for public space planning, public art, green spaces, trails and beautification projects with community partners. To preserve and promote our natural, cultural and historic resources while striving to enrich the quality of life and economic growth through active community partnerships, promoting special events, enhancing green spaces and protecting our environment for future generations. It is our desire for the Parks and Beautification Department to ensure future growth and development throughout Macon-Bibb County through teamwork, green practices, responsible conservation, community partnerships and business involvement. A special event is defined as an activity within a community that brings together a large number of people. Examples include but are not limited to parades, concerts, 5K races, fundraisers, conventions, political rallys, protests, and marches. If you are interested in presenting a special event in a Macon-Bibb County facility, please read the entire policy. The organizer of a special event must fill out this application and return it to the Parks and Beautification Department not more than 12 months or less than 30 business days prior to the start of the event. Payment and liability insurance must be submitted with the application. 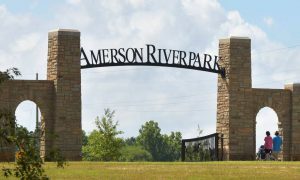 Amerson River Park contains 175 acres of pristine forests, meadows, and wetlands surrounded by a river oxbow. Come play on the state-of-the-art handicap-usable playground where all children, regardless of physical ability, can enjoy swings, slides, and other playground equipment. Walk, ride, or run the 3.5 miles of trails throughout the park. Enjoy the Ocmulgee River on a kayak, sitting in a canoe, or floating in a tube. At the north end of the Park, there is a canoe launch on the Ocmulgee River. Enjoy a tubing float from the Jay Hall Memorial Canoe Launch to the Bragg Jam Canoe and Tube Takeout. The Park offers exciting amenities that families, adventurous outdoorsmen, and nature lovers will enjoy. Accepted forms of payment are money orders and personal check. Both Rental fee and deposit required to be paid at time of reservation. Separate payments for rental and deposit. All Vehicles left in the park after closing hours are subject to be towed at owners expense. If any rules are not followed or pavilion area is left in a mess your deposit will be forfieted. Heritage Trail Spring Street $100/3hr. period w/ $35 ea. Additional hr. Damage Deposit (Damage, City Svc., ETC) $500 min.